Are you considering taking the train to Japans northern island? Heres our top things to do in Hakodate & reasons to stop and explore the gateway to Hokkaido. I love train travel and the Japanese Shinkansen are my personal favourite. 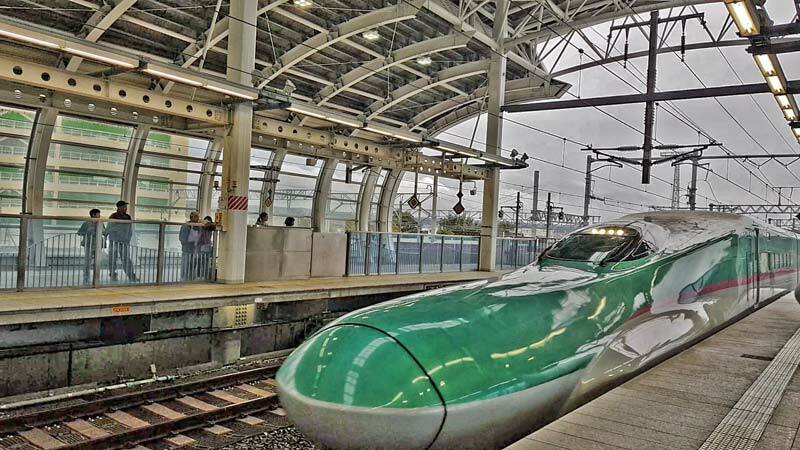 Not only are they super fast and run to an exacting timetable but they can be a real bargain for tourists wanting to see more of the country using the Japan Rail Pass. As I waited to board at Hachinohe station bound for Hakodate I was excited to add the Hokkaido Shinkansen line to my list of routes travelled. This line only opened in March 2016 so although I’d been to Sapporo I’d not made the crossing by train before. It’s some feat of engineering that we’d be crossing under the Tsugaru Strait, the body of water that separates the prefectures of Aomori and Hokkaido, deep under the sea through the Seikan tunnel. Did you know there is also a JR East pass now that covers Eastern Japan and Southern Hokkaido? You can use it for any 6 days in a 2 week period between Tokyo and Sapporo so it would be perfect for including a visit to Hakodate. You can check the latest price and details here. The trip takes 90 minutes and you’re in the Seikan tunnel for 54 kilometres although only 23 kilometres of that are you actually underwater. The tunnel runs 240km beneath sea level and is the worlds longest running tunnel section under the ocean. The tunnel originally opened in 1988 but was refitted with dual gauge tracks for the Shinkansen service that opened last year. In hindsight I’m surprised I wasn’t a bit more apprehensive, especially considering my Aomori Hotel room had been rocked by a 5.8 magnitude earthquake only days before but the tunnel has withstood much worse. My only pre-boarding priority was my ritual detour to the conbini (convenience store) to stock up on drinks and snacks as I do before any Shinkansen trip. Some people have to snack in the movies, I have to have a snack on long-distance trains. We’d spent a few days in Hokkaido previously when we visited for the Sapporo Snow Festival and the Otaru Snow Light Path Festival, and I had fond memories of it being super friendly and enjoying some excellent food, something that will usually cinch the deal on a return visit. It’s a cooler climate up there and cold sea water produces a fabulous array of fresh and delicious seafood. Hokkaido is also known for its milk and serves up some delicious milk tarts & Japanese style cheesecake that are so different to what we have in the west, super soft milk bread is a real treat and the regions famous rich milk ice cream is so good it’s something you have to try at least once. The bullet train trip was very comfortable as I’ve come to anticipate, I travelled in an ordinary car but it wasn’t overly busy and I had a row to myself so I quickly hopped in the window seat to enjoy the view while there was one. Mentally you know that you are going to be underwater for around 20 minutes but it’s not something you really think about as it’s just a long and straight tunnel, something you are very used to travelling around Japan by train. The speed through this section is slightly slower than some routes at 160 km/hour but still a very fast and convenient way to move between the two islands especially when you think that only 30 years you’d have had to take the ferry and even a year earlier it would have been a much slower and less comfortable trip on the single gauge railway. Arriving in any new city one of the first things I try to do is to find some elevation to get my bearings and the layout of the area. 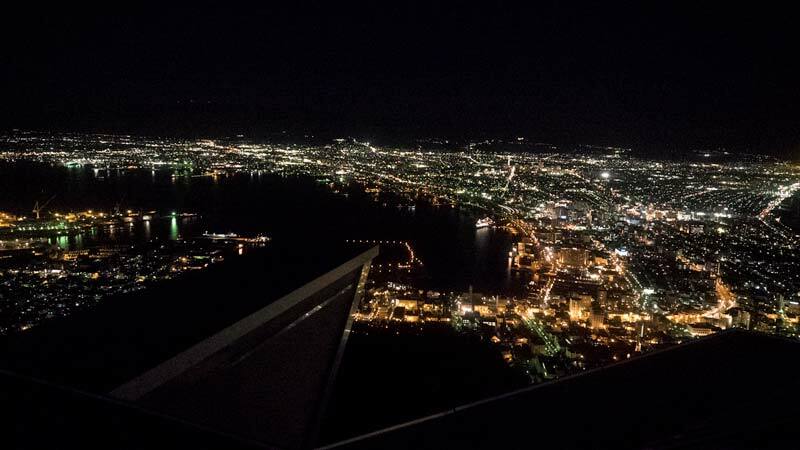 Hakodate is perfect for this whether you choose to do it during the day or night. Mount Hakodate or Hakodateyama as it’s called locally is 334 metres high and conveniently located at the southern end of the peninsula meaning the entire city is sprawling out below you. The mountain is heavily forested but there are a number of ways of getting up to the top. Cars and many buses make their way up by road but for something a bit different the Hakodate Ropeway is a fun alternative. It costs Y1280 for a return trip and can be paid in cash or using you PASMO or similar stored value card. 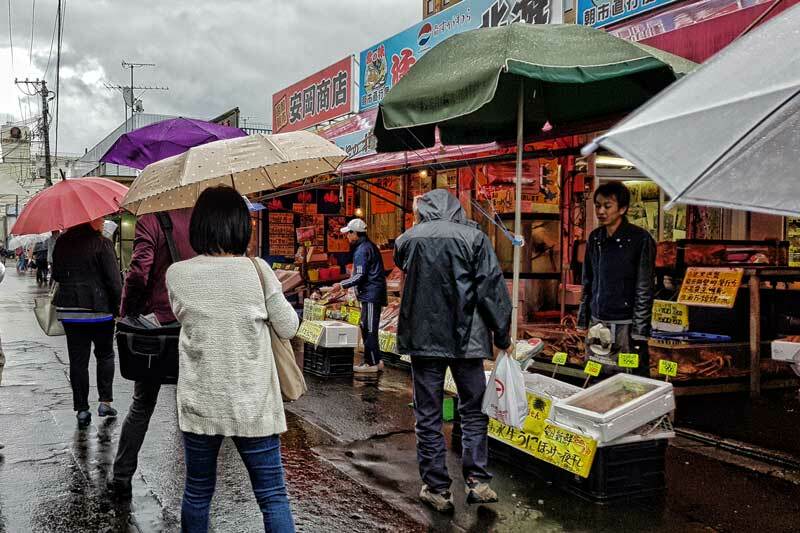 I’ve recently shared my experience eating my way through the Hakodate morning market. It was one of the most anticipated parts of my visit to Hakodate. Produce markets are a favourite stop for many foodies, especially here in Japan where there’s almost always a delicious array of ready to eat options in addition to the fresh produce. The morning market opens at 5 am and the early morning is when it’s has the most atmosphere and bustle but there’s no need to get up before the sun does. Although it’s called a morning market many of the vendors stay open until around 2 pm so you have time to get down here. My preference though is to get in early, skip my usual breakfast, and see what culinary opportunities a market presents, I’ve never been disappointed. The main focus of the market is squid (ika), a variety of different crabs (kani) and shellfish. Fish here including tuna and salmon are delicious but seem to be a smaller part of the trade. I did rather over indulge in excellent quality tuna the night before so I’m happy to try the local favourites and recommendations, as someone who loves all seafood the opportunity to try some new ingredient or preparation is always welcome. 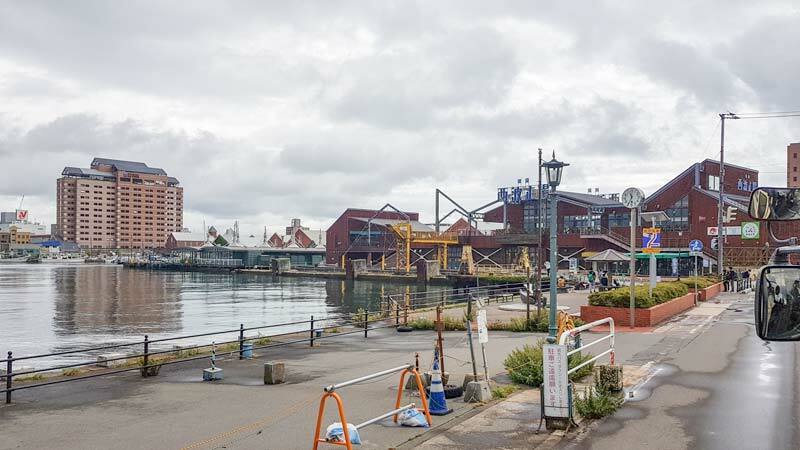 When Japans era of isolation ended in 1854 the Hakodate Port was one of the first to open to trade with the outside world, traders from China, Russia and the Western world moved into the area settling predominantly on the gentle slopes at the foot of Mount Hakodate. The result was an interesting mix of architectural styles throughout the Motomachi district and many significant buildings including official offices, historic residences and churches. If you are staying in town you’ll find most of central Hakodate is an easy walk. You can start at the morning markets and make your way along the attractively developed waterfront and up into the Motomachi District. If you want you can continue up to the Hakodategokoku Shrine with its gorgeous forested backdrop and views through its torii gate down to the bay. From here it’s only a short walk to the lower ropeway station. The feel and style throughout the Motomachi district are so different to other cities we’ve been in Japan, perhaps most closely aligned to the Oura settlement in Nagasaki which also had a substantial role in early international trade. The other popular area to spend time within the city is the bay area. At one end of town you have Hakodate station, this isn’t the Shinkansen station but it’s only a 15-minute train trip in from there. Along here you find a well-developed waterfront area with the morning market at one end and working your way along the bay you’ll pass a number of redeveloped historic warehouses, many of them in red brick that have been repurposed into shops, restaurants and for other commercial uses. Watch out for the large ferry moored directly outside the market, 30 years ago this was the only way to get between Aomori to Hakodate before the tunnel was built. The ferry is still operational today. It’s a vibrant port area and as you reach the end of the bay you’ll see Mount Hakodate looming up in front of you. Head towards the hills to discover the Motomachi district, walk up the road beneath the giant tori of Hakodategokoku shrine and from the top look back at the view of the bay. From here you can head slightly right to the ropeway station for a ride to the top and great views along the way. 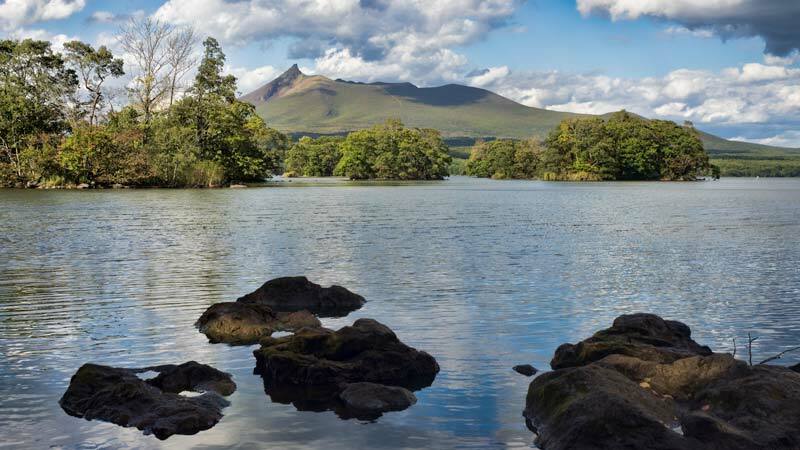 The Onuma Quasi National Park is an easy 50-minute train trip from Hakodate or you can stop off here on the limited-express train through to Sapporo at Onuma Koen Station. This natural area is very beautiful with the larger lake Onuma to the east and Ko-numa to the west. The lake is dotted with small islands and can be explored from the many short walking paths that cross bridges over the water along the way. Boat cruises are another popular option and if you are feeling energetic you can hire cycles locally for around Y1000 a day to complete the 10 km cycle trail around the lake. We were fortunate to be there on a day when Mount Komagatake, the distinctive extinct volcano core was clearly visible, often it’s tip is lost in the clouds. In late September when we visited we were still too early for Autumn colour but only by a couple of weeks, it generally starts arriving in the area around mid-October. The map shows the layout and distances between the places visited and mentioned in the article. To view it in Google maps click the 4 cornered square in the top right or to see the details of the individual attractions marked by each pink pin click onto it. Hakodate is a compact city that’s ideally situated a to explore on your train journey north into Hokkaido. As the gateway to this dramatic and different Japanese island, I’d highly recommend stopping the night or you can stow your bags in a locker at Shin-Hakodate-Hokuto and take the 15-minute train trip into Hakodate station which is right on the waterfront and start from there. There’s no shortage of things to do in and around Hakodate city to keep you busy for a few hours or a few days. Thanks for the insight. We are heading to Sapporo early March then heading back down to Tokyo on the train. It will be a long trip but looking forward to it providing us with some down time after skiing in Niseko for 4 days. This has me considering a stop off at Hakadate for a look around. I’d like to do the full trip by train one day. Hakodate could be a good natural break to stretch your legs, are you switching to the bullet train from there? I’ve always dreamed of riding on a bullet train Toni. Same deal here; I need my fixins for a long term train ride. Although the comfort and speed of a bullet train ride for that amount of time would arrest my attention. I am used to slower long train hauls in places like Vietnam where trains are not quite like bullet trains….although the snack carts are wheeled to you on those slow poke trains LOL. I love any sort of long-distance train travel. The shinkansen also have the food and drink cart come around, all very civilised but I do love my ritual shopping for some of the more unique local options to try.